dwgConvert 9 is a very easy-to-use, fast and reliable AutoCAD® file format converter (AutoCAD version converter). • High Quality format / version conversion (such as convert AutoCAD higher version to lower version. 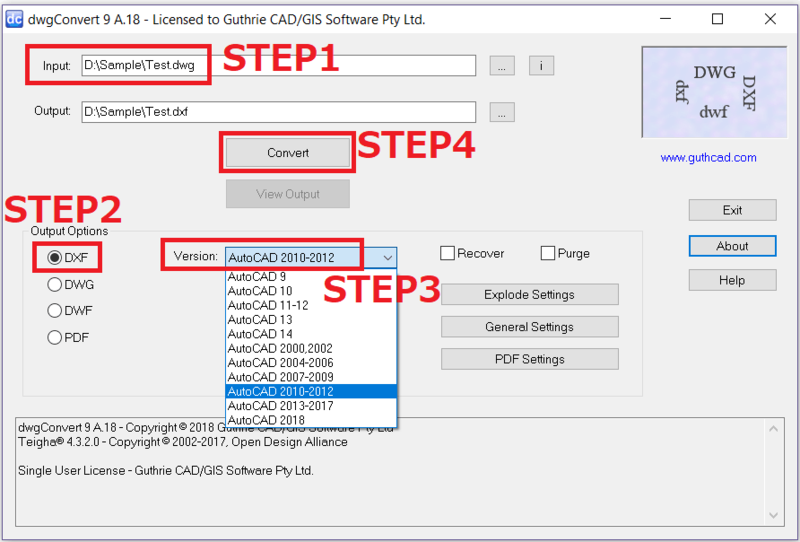 For example: convert Autocad 2019 to 2010 or convert Autocad 2019 to 2007 etc.) . All our software come with permanent license (one-time payment), 1-year free upgrade and 1-year free technical support! How do I convert a DWG to an older version? Step 1: Select an input DWG file. Step 2: Choose DWG or DXF format. Step 3: Select AutoCAD 2010 as version. dwgConvert has all the features you need to convert AutoCAD drawings to other AutoCAD formats or PDF. 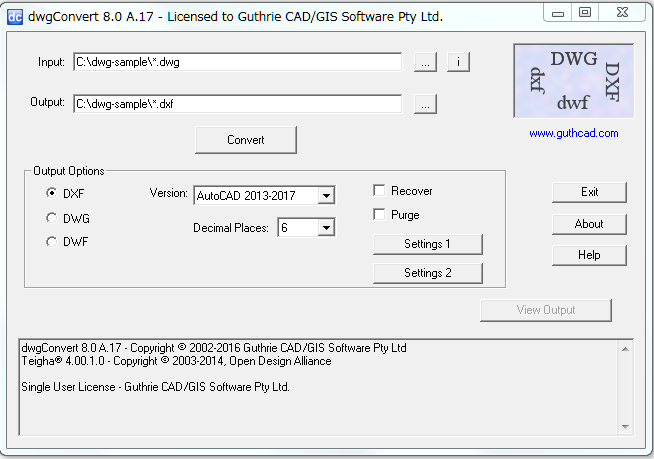 dwgConvert converts between DXF and DWG files, and between DXF and DWG versions. All AutoCAD DXF/DWG versions through to AutoCAD 2020 are supported. You can also convert component entities in conversion (in this example, block reference is selected). "I’m very impressed with dwgConvert. Now I can stop using the Segs custom lisp in AutoCAD to convert arcs to polylines! Your software works like a charm." "Thank you very much!!! dwgConvert is very useful for me." • Converts among DWG, DXF and DWF files, such as converting DWG to DXF / DXF to DWG / DWG to DWG etc. • Converts all DWG, DXF and DWF files to PDF, such as converting DWG to PDF / DXF to PDF / DWF to PDF. • Superior conversions to earlier versions of AutoCAD allow closest preservation of the original drawing. • Available via both within the user interface, and on the command line. • Explode complex entities such as Attrib, Table, Spline, Region, 3DSolid, Body, Mechanical Desktop, Block, Dimension, Leader, Hatch, Polyface Mesh, 3D Face, Ellipse to simpler entity types. • Repair damaged drawings using the software's advanced audit and recover. • Purge unused Blocks from the drawing. • Fix non-Autodesk generated DWGs that may trigger a false 'Student Version - Plot Stamp Detected / PRODUCED BY AN AUTODESK STUDENT VERSION' condition in AutoCAD 2019. * Please note: This function does not remove the 'Student Version - Plot Stamp Detected' condition from drawings that were genuinley produced in a Student Version of an Autodesk product, it only repairs some non-Autodesk generated DWGs which AutoCAD 2019 misidentifies as being produced in a Student Version of an Autodesk product when in fact they were not. I.e. the purpose of this option is not to bypass Autodesk's restriction on the use of its student software, only to repair some non-Autodesk drawings that are known to falsely trigger the condition. The evaluation version of dwgConvert is enabled for 7 days and for 7 file translations with no size limit. The trial version is converted to the full version once the software is registered. Buy a standard license. Prices start from $75 USD. You can see details of the price structure from here.